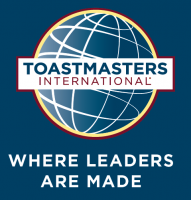 Join our group of Toastmasters club as we learn, practice and grow together as we follow a curriculum designed to improve our public speaking and develop leadership skills. ng. Come to listen or participate and see for yourself how this program can help you or someone you know. Buy an All you can Eat Pizza ticket at Thirsty Joe's and get 1/2 hour VIRTUAL REALITY pass.